Yesterday’s performance was a shot across the bow for bulls, especially because the Nasdaq Composite closed below strong triple support. However, the Nasdaq recovered and seems intent on moving to new highs. 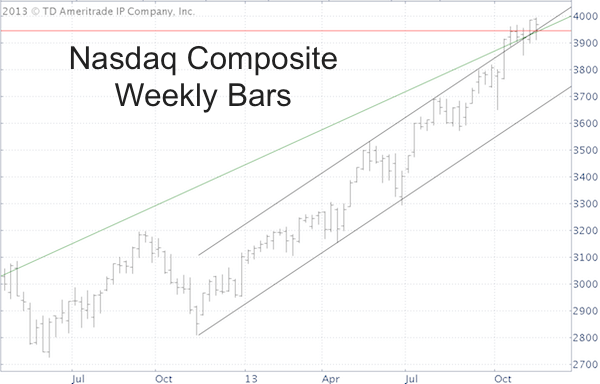 Yesterday the Nasdaq Composite fell below three long-term support levels. Unlike the Nasdaq, the S&P 500 stayed above important support. How high can the Nasdaq and the Nasdaq QQQ ETF (Nasdaq: QQQ) fly? Regular market forecast updates (at least twice a week) and corresponding trade recommendations are provided via the Profit Radar Report. Every index has at least one VIP component. Apple is the VIP for the Nasdaq-100 and S&P 500. IBM and VISA are the VIPs for the Dow Jones Industrial Average. When a VIP is ailing, the index has a hard time firing on all cylinders. That’s the case for the Dow Jones right now. Prior to the latest Dow Jones reshuffle IBM used to rule the roost. Effective September 20, 2013, Nike, Goldman Sachs and Visa replaced Hewlett-Packard, Bank of America, and Alcoa. Prior to the reshuffle IBM accounted for a whopping 10% of the Dow Jones Industrial Average (DJA: ^DJI). The Dow’s runner up VIP was Chevron with 6%. Today IBM is only the second biggest Dow Jones component, making up ‘only’ 7.45% after VISA with a weighting of 7.93%. Nevertheless, when one of the Dow components hits a speed bump, the Dow tends to suffer. IBM is hitting such a speed bump right now. 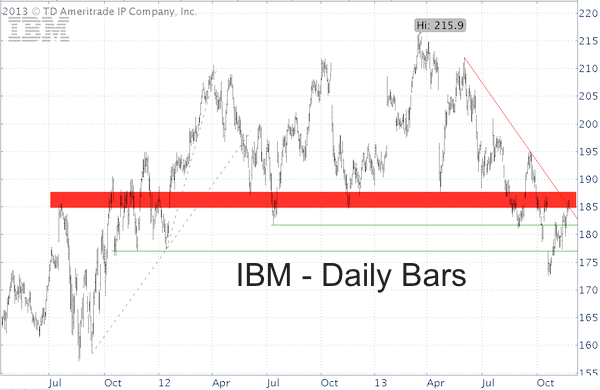 As the IBM chart below shows, trade is pausing at a descending trend line and at a wide resistance zone made up of prior highs and lows. How come the Dow Jones Industrial Average and Dow Jones Diamond ETF (NYSEArca: DIA) have pushed to new all-time highs even though IBM is trading 14% below its high? It has to do with the strong performance of the financial sector. The financial sector is near new recovery highs and since the September reshuffle the financial sector makes up 16% compared to 11% before the component change. Regardless of its composition, Dow Jones and Dow Jones ETF are also gnawing at an important resistance level. The media makes us believe this all-important milestone is round number resistance at 16,000, but it isn’t. How much QE is enough? Based on the latest statement by a Federal Reserve president, the Fed may beef up QE by another 26% in 2014. However, there’s also another interpretation, which would nail the financial media for shoddy reporting. Charles Evans is the ninth president and chief executive officer of the Federal Reserve Bank of Chicago. As a Federal Reserve president Mr. Evens is fluent in the art of sending cryptic messages. The above tweet is no different. What could Mr. Evans have meant? Currently the Federal Reserve is buying $85 billion worth of assets per month. That’s $1.02 trillion per year or $1.19 trillion until January 2015. Going from the current pace of $1.19 trillion to $1.5 trillion in asset purchases is an increase of 26%. Is Mr. Evans saying that the Fed may have to further beef up QE? $1.5 trillion is an incredible amount of money. How incredible? According to the World Bank, the total market capitalization of the U.S. stock market was $18.67 trillion in 2012. Total market cap includes the S&P 500 (SNP: ^GSPC), Dow Jones (DJI: ^DJI), and every other U.S. index you can think of. $1.5 trillion is enough to buy 8% of all U.S. traded stocks. No wonder the S&P 500 and Dow Jones have nowhere to go but up. Comparing the Fed’s current $4 trillion balance sheet with the total U.S. market cap (projected to be $21.4 trillion in 2013) almost allows the conclusion that the Federal Reserve conceivably financed 17% of all U.S. stock purchases. When considering the size of the Fed’s balance sheet and active purchases in correlation to the total U.S. stock market, it seems almost inconceivable for the S&P 500 ETF (NYSEArca: SPY), Dow Jones Diamonds ETF (NYSEArca: DIA) and any other broad market ETF or index to catch a sustainable down draft. The Federal Reserve is already buying more than $85 billion worth of assets every single month, but the financial media largely omits the real scope of all QE-like programs. How much is the Federal Reserve really spending every single month? ‘Dow 16,000’ or ‘bubble’ or contenders for the fictitious un-word or non-word of the year award. While the anti-appeal of the word bubble may be fictitious, the resistance provided by the Dow Jones Industrials chart is not. Forgive me for using the much overused “B”-word (bubble) in my headline, but it appears unfashionable nowadays to write any article without a reference to the B-word (I believe there’s a significance to that. More below). The Dow Jones (DJI: ^DJI) is chipping away at round number resistance at 16,000. Round number resistance in itself is enough to capture the media’s attention and imagination. Combine this with the media’s eagerness to see a bubble burst and you have a perfect recipe for disaster, right? The First Bubble Seen in Advance? This would be the first bubble seen in advance, so a disaster here is very unlikely. What about Dow Jones 16,000, is it significant resistance? Dow Jones 16,000 is round number resistance, the same as 1,800 for the S&P 500 (SNP: ^GSPC). Prices do tend to struggle briefly around round number resistance. The Dow Jones chart below highlights round number resistances from 10,000 – 16,000 (purple lines). But there is more important resistance for the Dow Jones and by extension the Dow Jones Diamonds ETF (NYSEArca: DIA). The red trend line goes back many many years and provides more important resistance for the Dow Jones than the round number resistance in itself. This trend line resistance was first featured in the August 7 edition of the Profit Radar Report and was used as an eventual target for the QE bull market. Since the two levels are only separated by 150 points, there is stiff resistance in the low 16,000s. 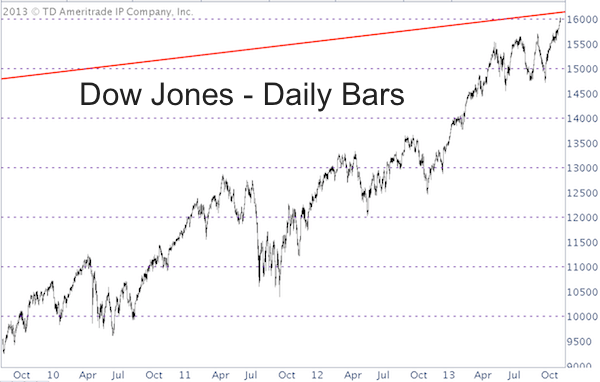 Will the Dow Jones be able to overcome Dow 16,000? Will the S&P 500 be able to overcome 1,800? In particular, I am using this trend line in combination with a duo of indicator that has directly ousted the May, August, and September declines as only temporary corrections. A long-term chart and detailed analysis for the Dow Jones and S&P 500 is available to subscribers of the Profit Radar Report. 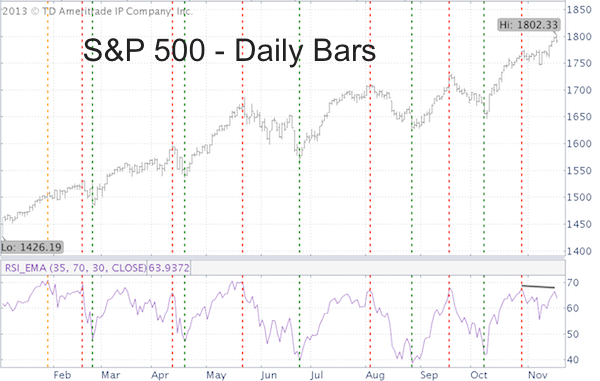 Bearish divergences are often just that for the market – bearish. Right now there is a bearish divergence between RSI and the S&P 500, but is this divergence enough to mark a major market top? To find out we will take a look at the recent track record of RSI and the track record of two very reliable divergence indicators. The S&P 500 chart below shows that RSI (I use a 35-period RSI) has not confirmed the S&P 500’s latest all-time high. In fact, considering the strength of the rally, the RSI lag is quite blatant. RSI used to be a valuable and often used tool in my technical analysis toolkit. I used bearish RSI divergences to warn of the 2010 and 2011 corrections and bullish RSI divergences to pinpoint the October 2011 and June 2012 lows. However, in 2013 RSI hasn’t been of much use. The S&P 500 (SNP: ^GSPC) chart below shows that not a single S&P 500 high (green lines) or low (red lines) was accompanied by a RSI divergence. The RSI high for the year occurred on January 29 (yellow line), but January 29 didn’t mark any meaningful high and neither did any of the subsequent high watermarks in April, May, August, September or October. What about the November High? A more reliable breadth and breadth divergence gauge is the NY Composite Advance/Decline (A/D) line. This week’s new S&P 500 (NYSEArca: SPY) and Dow Jones all-time highs were not confirmed by the NY Composite A/D line – a bearish divergence. A similar bearish divergence accompanied the August high, which led to a temporary decline. Here is the wrinkle though. The NY Composite encompasses all the issues traded on the New York Stock Exchange (NYSE). A little over half of the NYSE traded issues are categorized as non-operating companies, which includes closed-end bond funds, preferred stocks, foreign stocks and ADRs. Most of those non-operating companies are interest-rate sensitive closed end-bond funds and preferred stocks. Rising interest rates, such as we’ve seen lately, artificially depresses the NY Composite A/D line, which explains the current bearish divergence. To get a more genuine A/D line one must strip the NY Composite A/D line of all non-operating companies. The ex-non-operating NY Composite A/D line did confirm the May, August and September highs and continually pointed towards new highs. The ex-non-operating NY Composite A/D line nearly confirmed Monday’s S&P 500 (NYSEArca: SPY) and Dow Jones all-time highs. In summary, a closer look at historically reliable breadth measures suggests that stocks are in for a temporary correction (depth yet to be determined) followed by another rally leg. Continuous updates on the NY Composite A/D and ex-non-operation A/D line is provided via the Profit Radar Report. Ironically the message of one of the most solid gauges in the business is confirmed by one of the most curious and non-scientific ‘indicators’ around. But don’t be fooled, although non-scientific, this indicator worked well earlier in 2013 and should not be ignored. 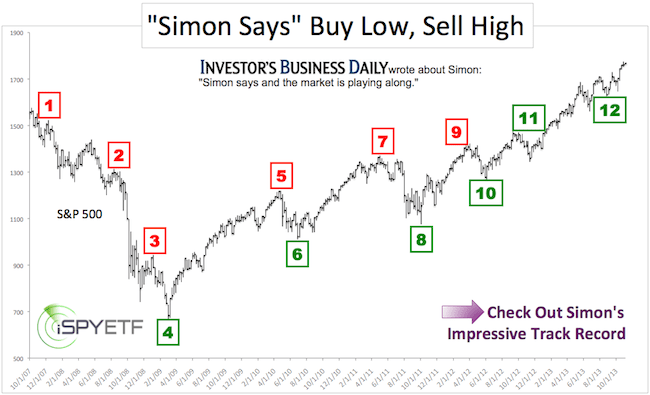 Click here for a fun, but worthwhile thumbnail analysis of this curious indicator and it’s meaning for the S&P 500. 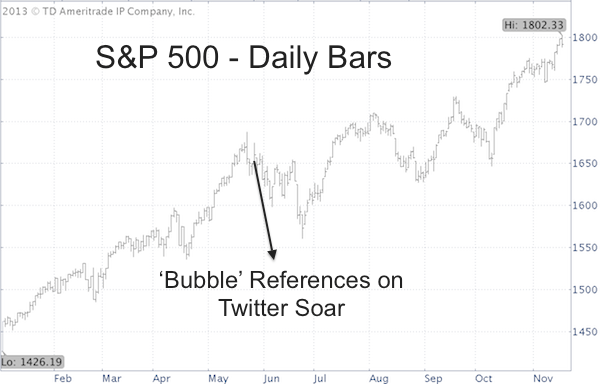 Can a Watched Bubble Burst? So you want to own gold. When is the right time to buy? Should I use gold ETFs to establish (or add to) gold positions? Here is a quick look at a simple but effective strategy to spotting good entry levels for the two biggest gold ETFs. Are you looking to buy and own gold? Do you want to buy gold at the lowest possible price? Gold is very pliable: A single ounce of gold can be stretched into a 5-mile long thread or beaten out into a 300-square foot shoot. Gold is non-toxic: You may find gold metal flakes (remember it’s pliable) in exotic foods or unusual Swiss liquor. I still have a bottle of GoldSchlager schnapps in my well stocked by under utilized bar. Gold is considered protection against financial turmoil. What kind of protection? Good question. I guess unless you were looking to buy protection against making money, owning gold in recent years has been little more than an expensive placebo (more on when to buy gold below). Regardless, many investors want gold to be part of their investment portfolio and feel that gold ETFs are a simple and superior vehicle for owning gold. There are a number of gold and gold-related ETFs. The two biggest gold ETFs are the SPDR Gold Shares (NYSEArca: GLD) and iShares Gold Trust (NYSEArca: IAU). Although IAU has a lower annual expense ratio (0.25%), GLD (with its 0.40% expense ratio) has more assets under management. Both ETFs track the price of gold well. As the gold chart below shows (the chart reflects actual gold prices, not gold ETF prices), gold prices can be quite volatile and buying or selling the precious yellow metal at the wrong time can cause a lot of headache (perhaps that’s where owning physical gold in the form of GoldSchlaeger schnapps helps). 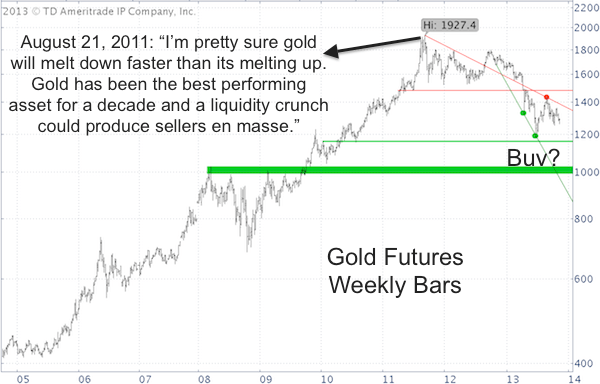 In 2011 gold was caught up in an outright frenzy or bubble. Since the 2011 high, there have been some smaller opportunities to buy gold (green dots). All of those opportunities occurred when gold prices found support at the green trend line. Overall though, buying gold in recent years has been a losing proposition. I believe that an opportunity to buy gold will soon present itself. The time to own gold will likely be when the price of gold falls to reach one of the horizontal green price support zones. I will continue to share my thoughts and forecasts on gold prices and GLD via the Profit Radar Report.